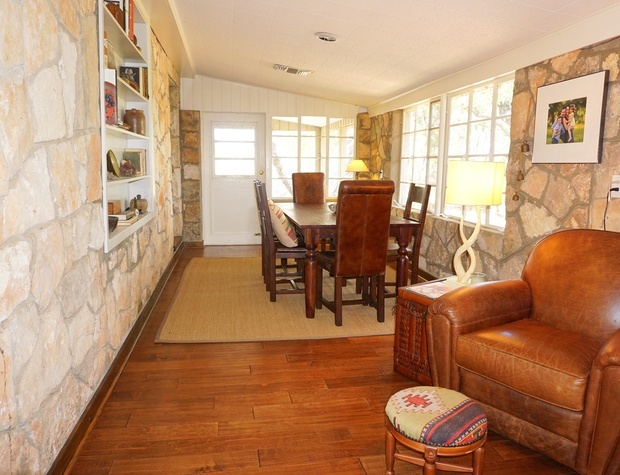 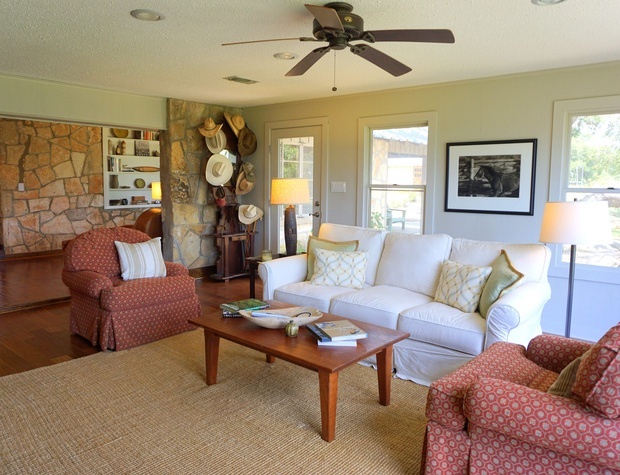 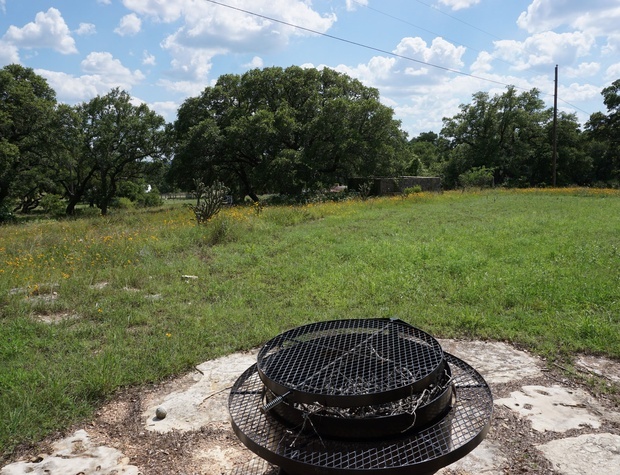 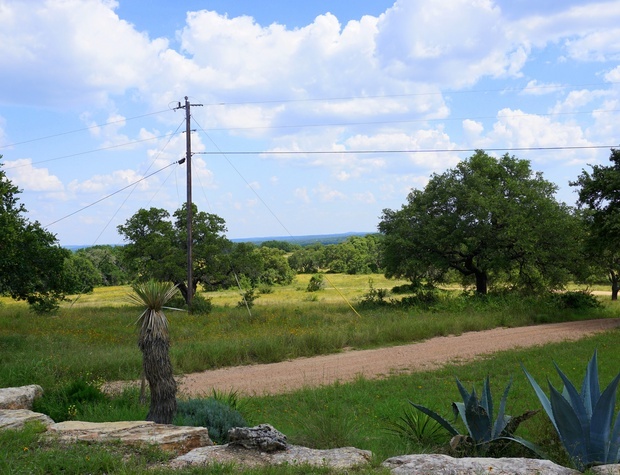 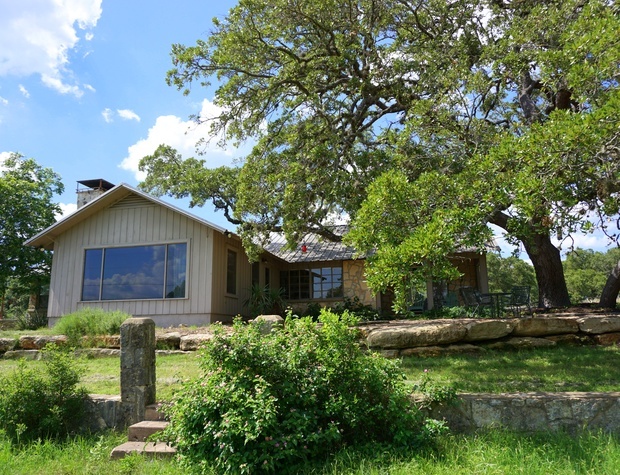 Heading towards Blanco, this old ranch home has been updated to create a comfortable getaway that treasures all the tradition of the Hill Country. 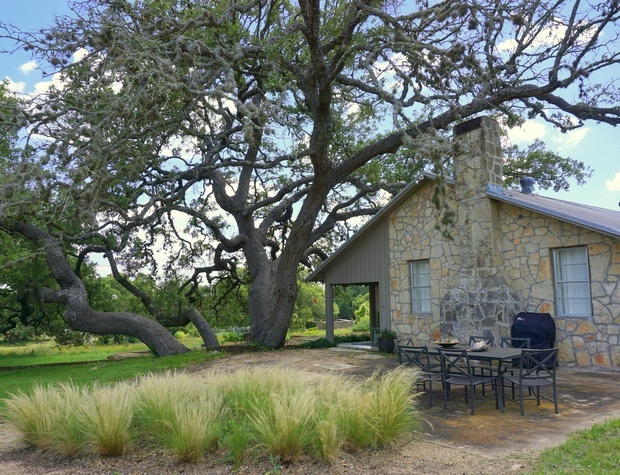 The home sits under several breathtaking Live Oak trees and lies secluded at the back of the property for a calming escape surrounded by nature. 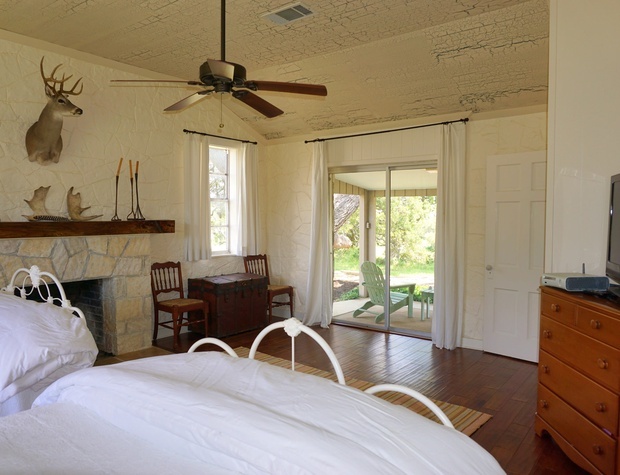 With antique décor combined with the elegance of the home, an inviting atmosphere is provided to make your stay as extraordinary as possible. 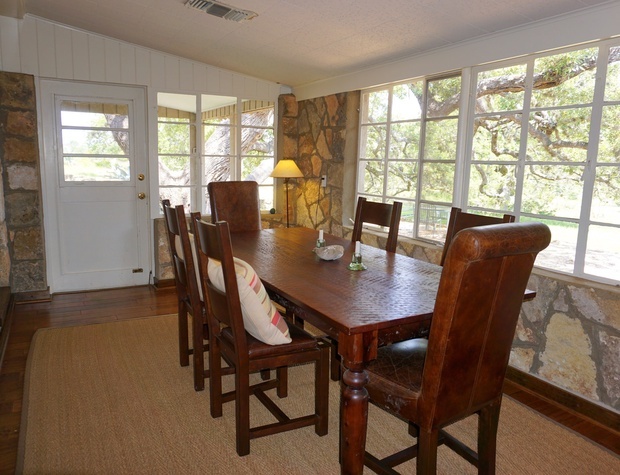 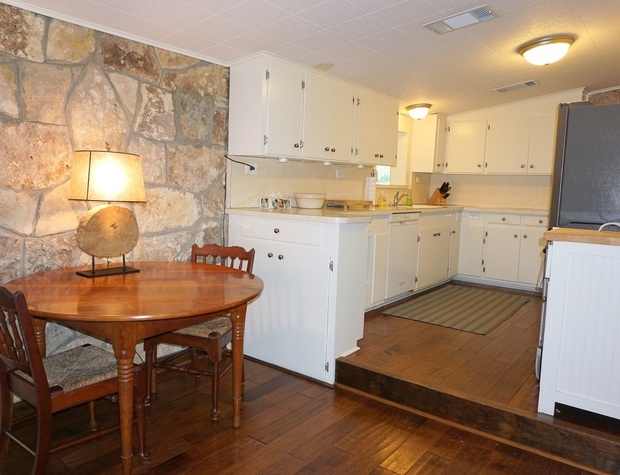 You will find that the home’s stunning rock exterior continues into the dining area. 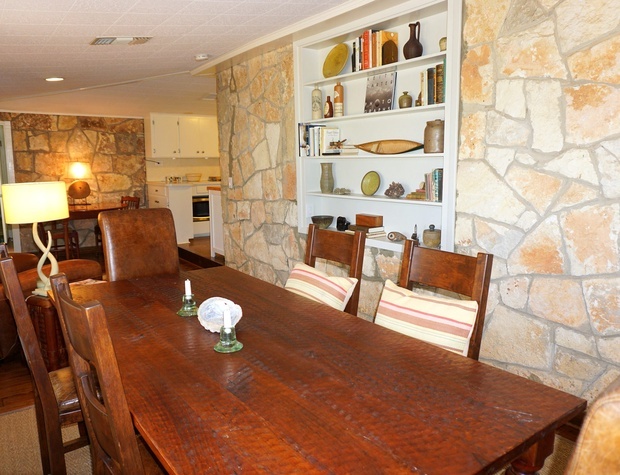 A six seat dining table and a two seat table sits to the left of the kitchen making room for eight people to sit comfortably and enjoy a meal. 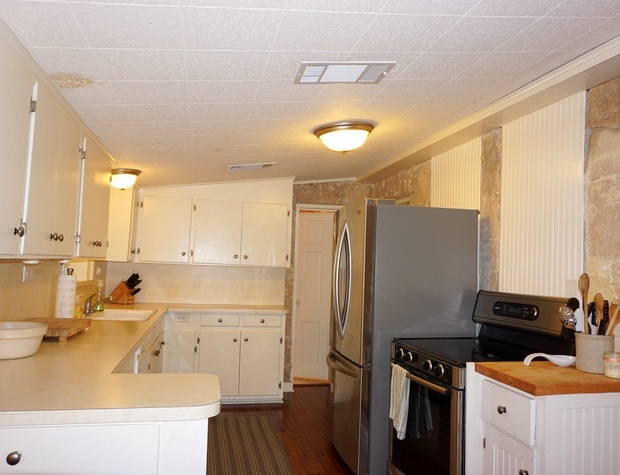 The kitchen is fully equipped and spacious, making it easy to prepare meals and gather with loved ones at the end of the day. 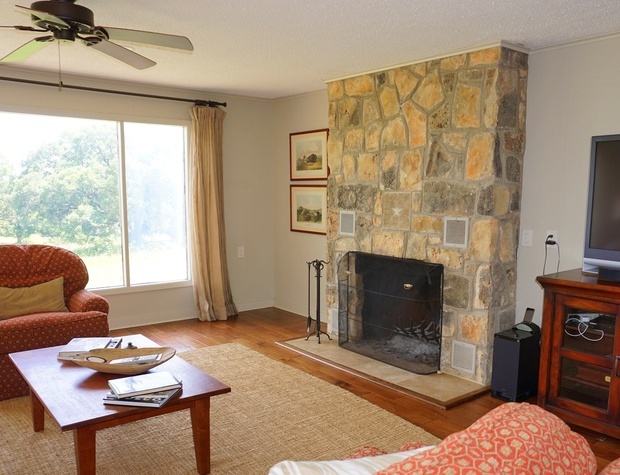 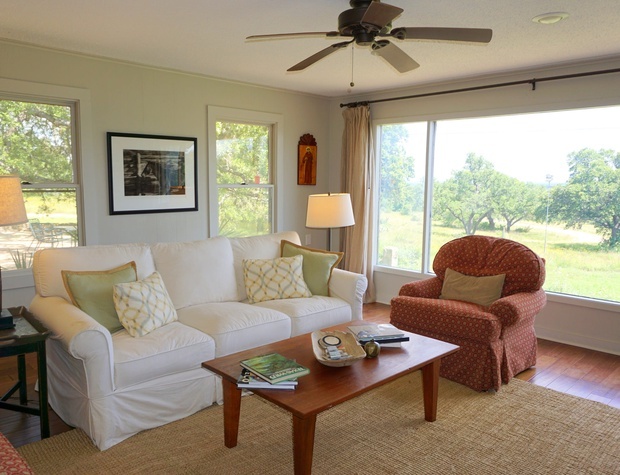 The living room, lined with windows, provides a bright and comfy place for any guest to relax. 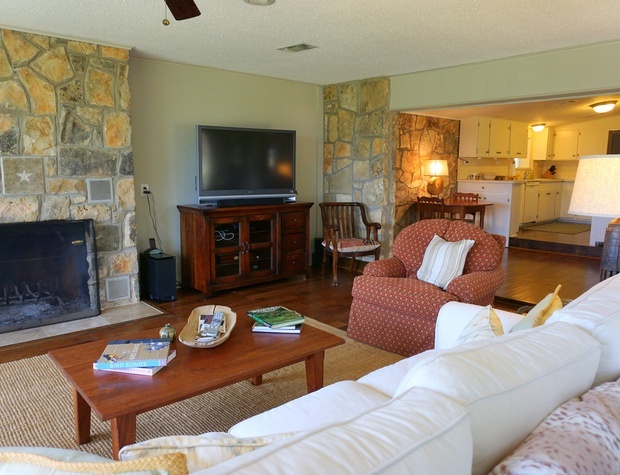 With a sofa and two chairs, you and your family can choose to gather around the stone fireplace or watch a movie on the flat screen T.V. 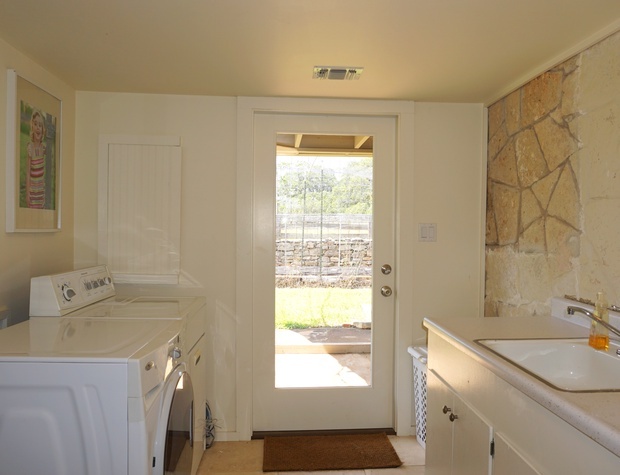 At the back of the house a bedroom, bathroom, and laundry area lie on the backside of the kitchen. 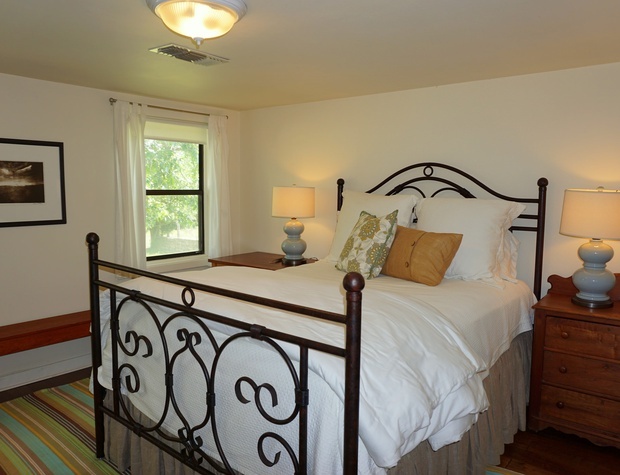 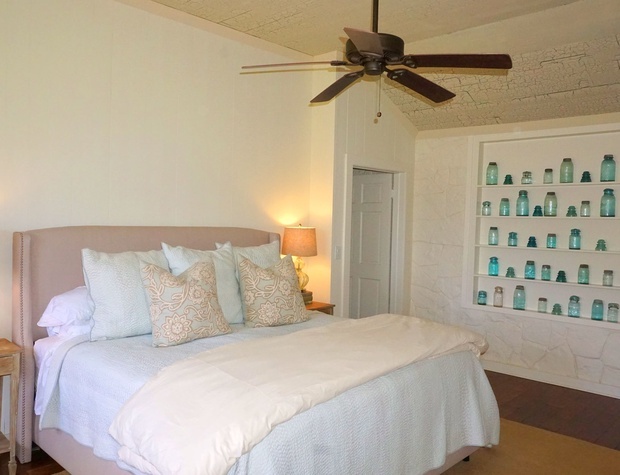 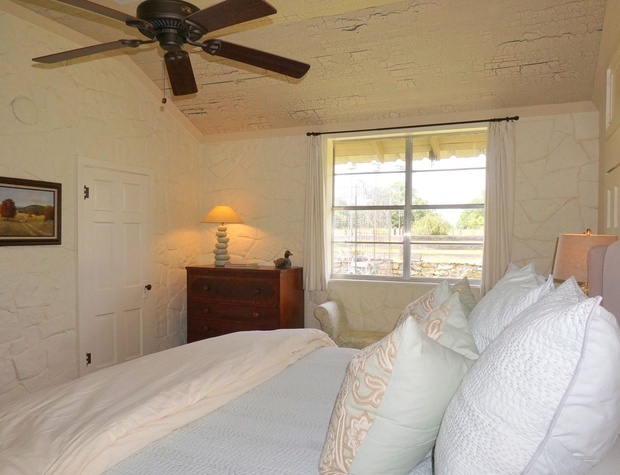 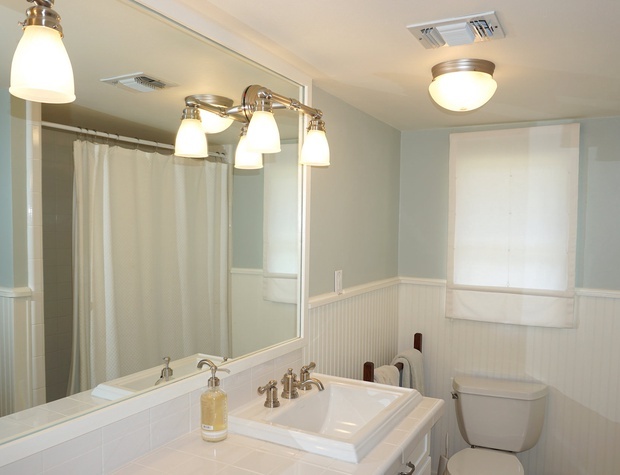 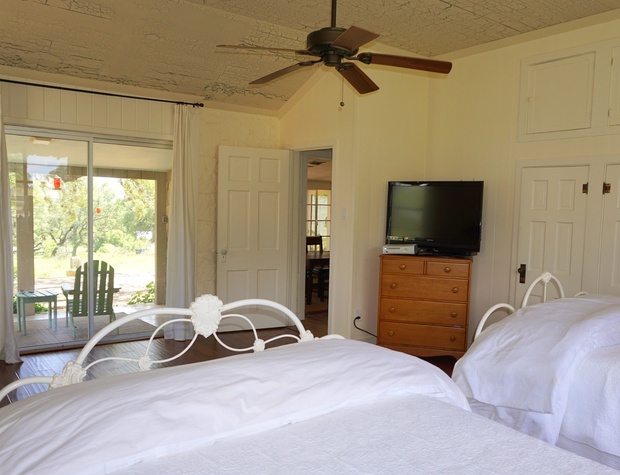 This room has a queen bed and a full bathroom for guests who wish to be separate from the rest of the home. 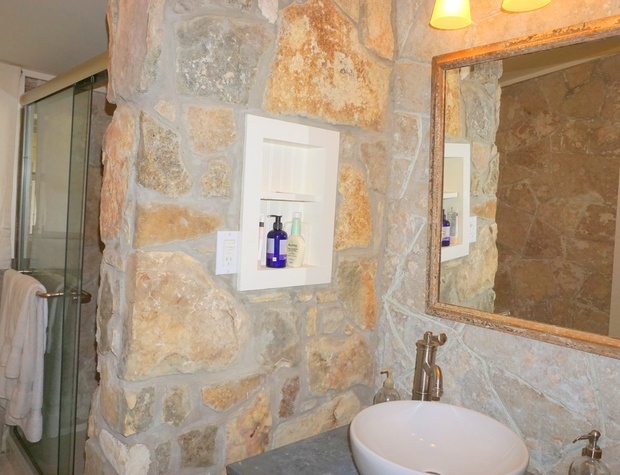 On the other side of the kitchen, a sleek full bathroom connects to a second bedroom with a King bed. 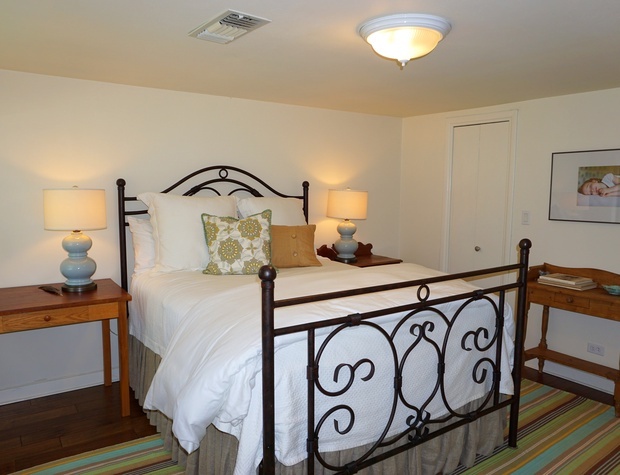 The largest in the house, this bedroom is simple yet elegant to create a welcoming atmosphere for all guests. 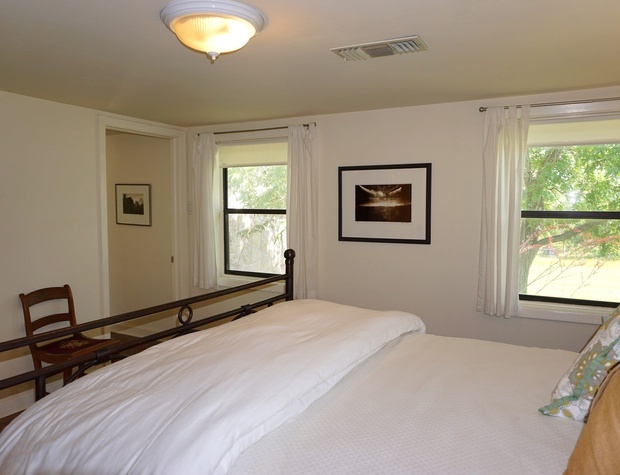 The third bedroom, equipped with two full beds, is a great area for kids to stay. 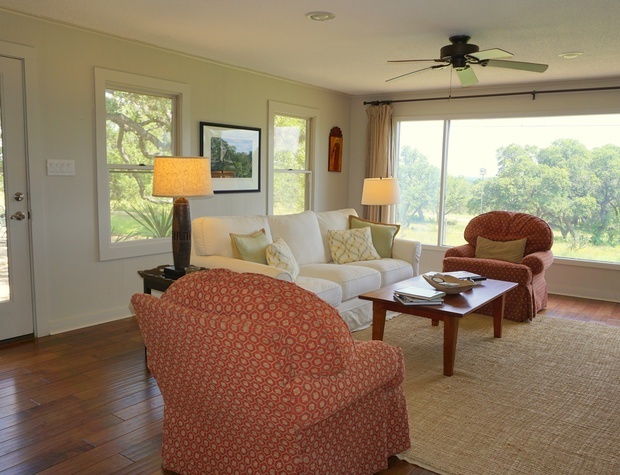 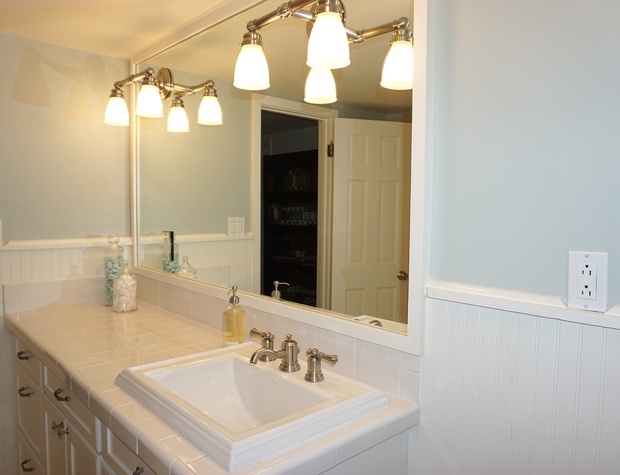 Bright and homey, this home has an interior that will enchant you. 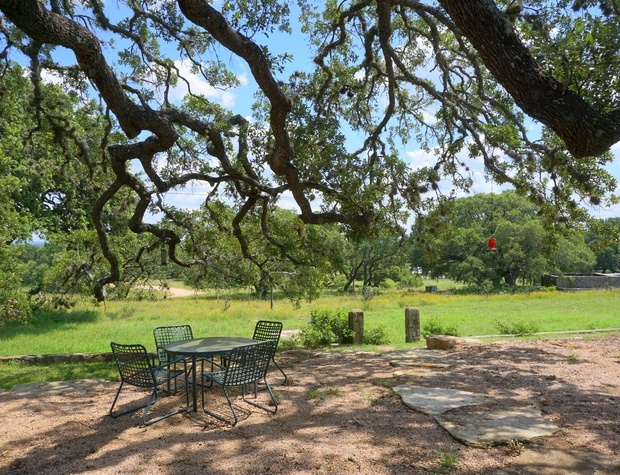 Outdoors you with find plenty of seating to enjoy the wonders of the nature that surrounds the home. 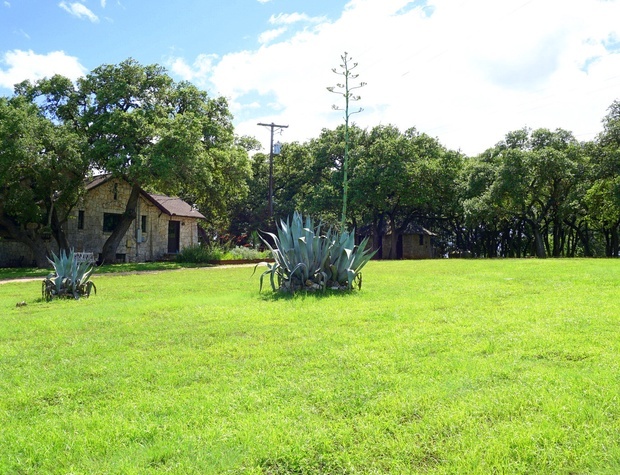 A short drive to Blanco you can enjoy all the historic town has to offer. 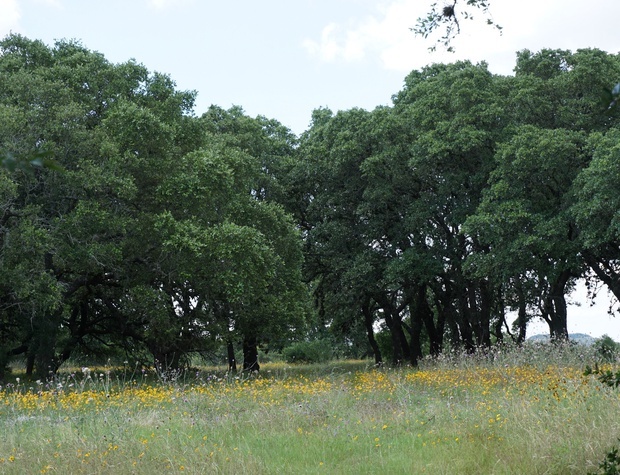 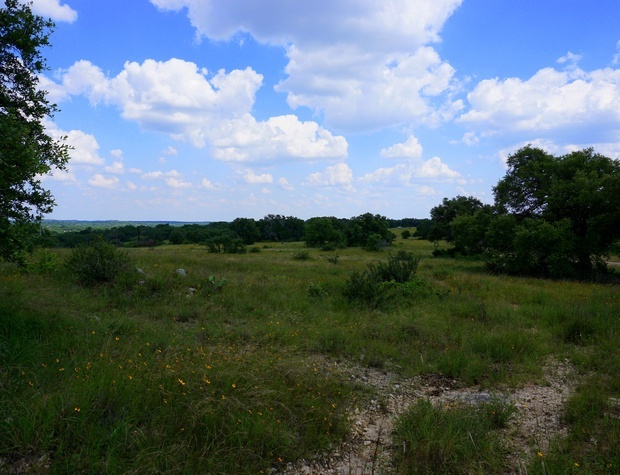 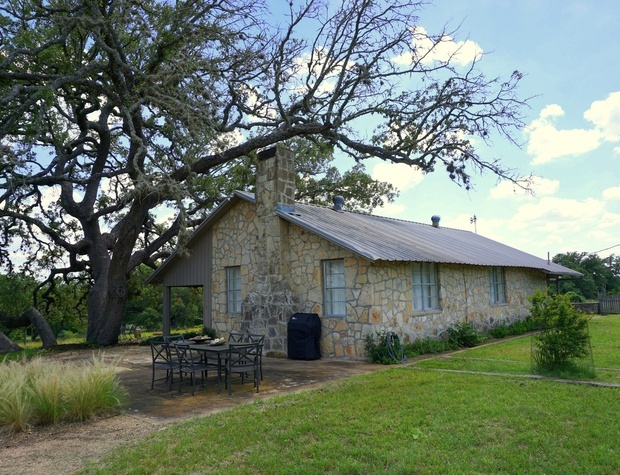 Nearby, Wimberley also provides many attractions you can enjoy with your family. 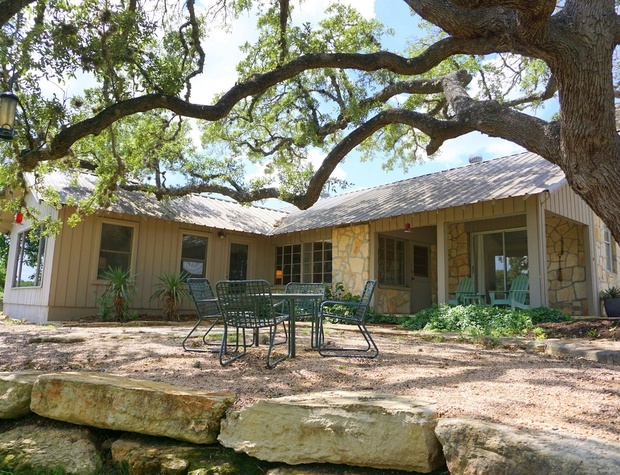 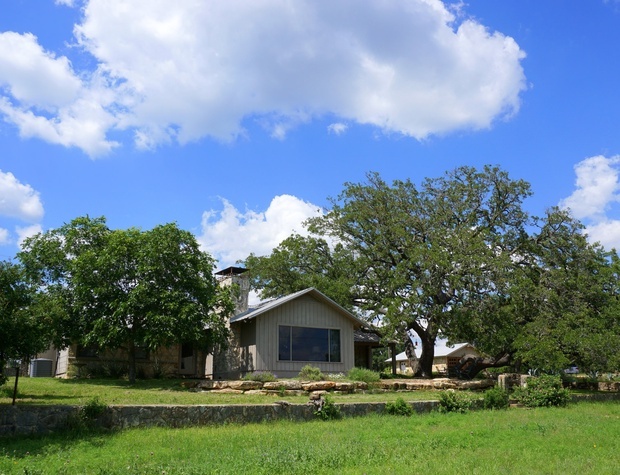 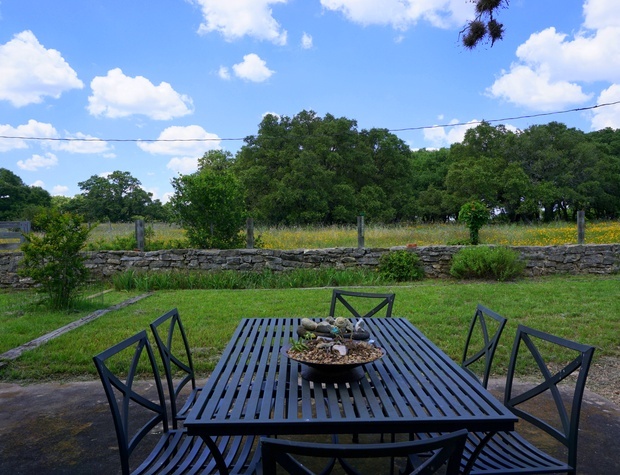 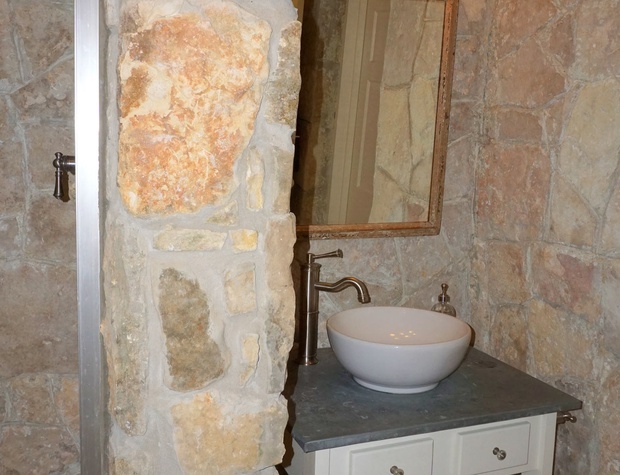 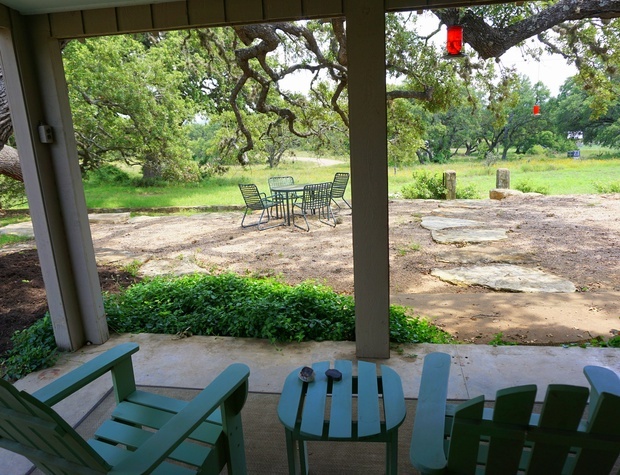 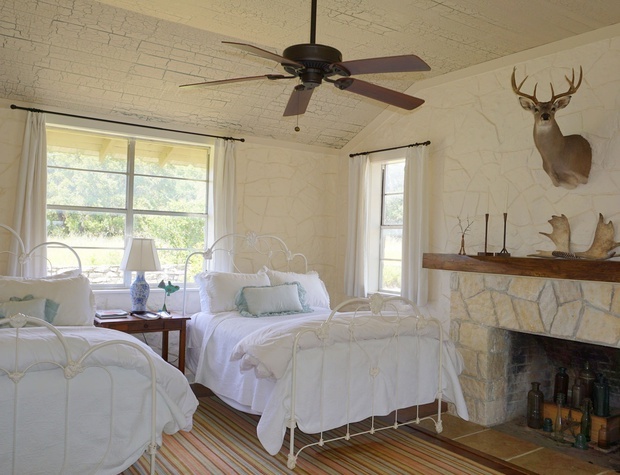 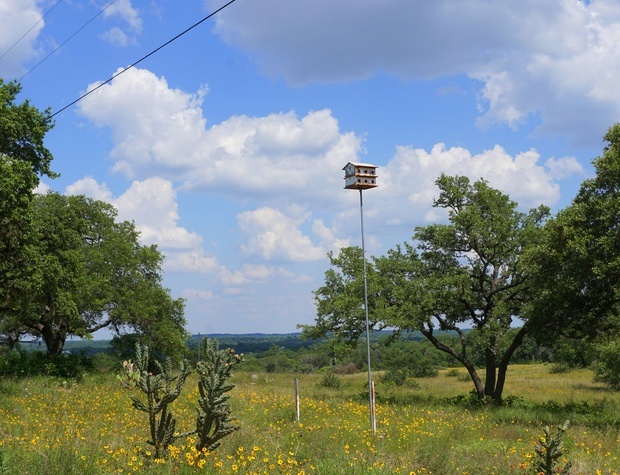 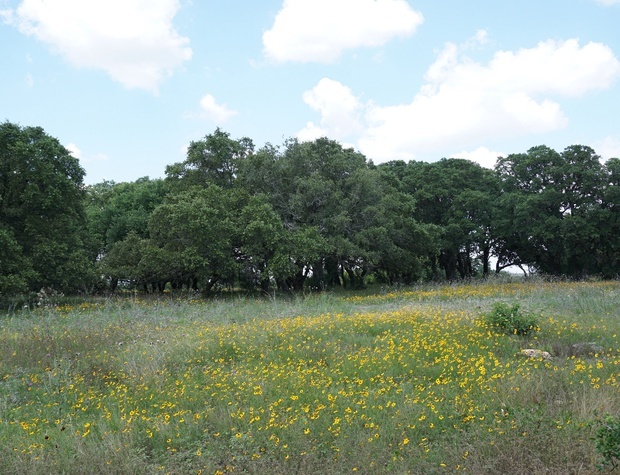 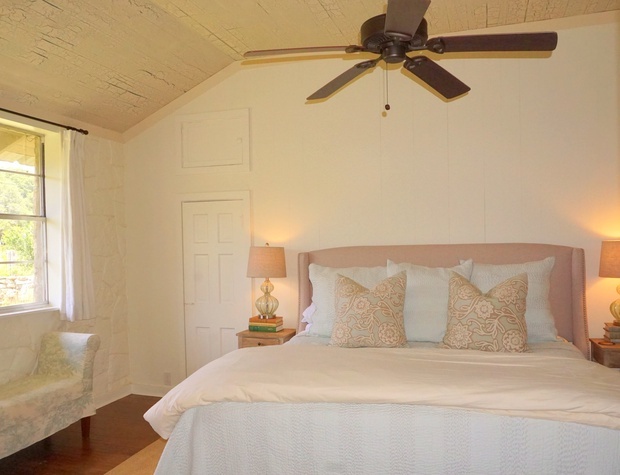 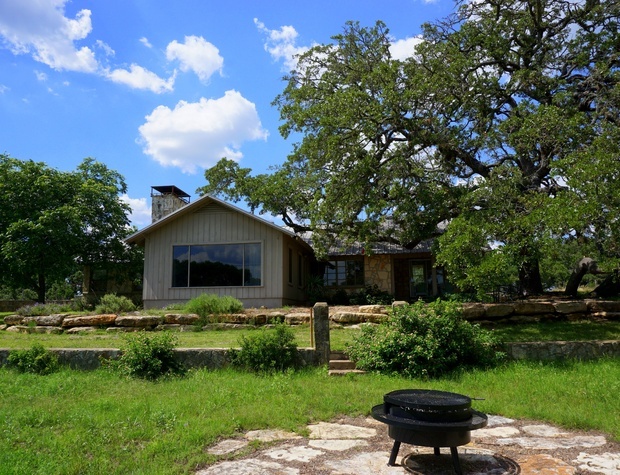 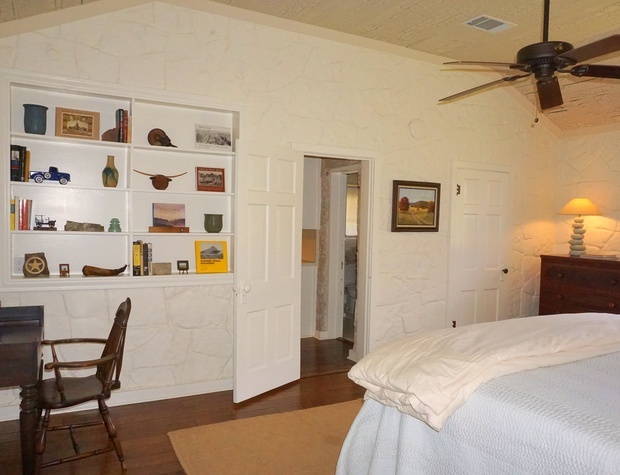 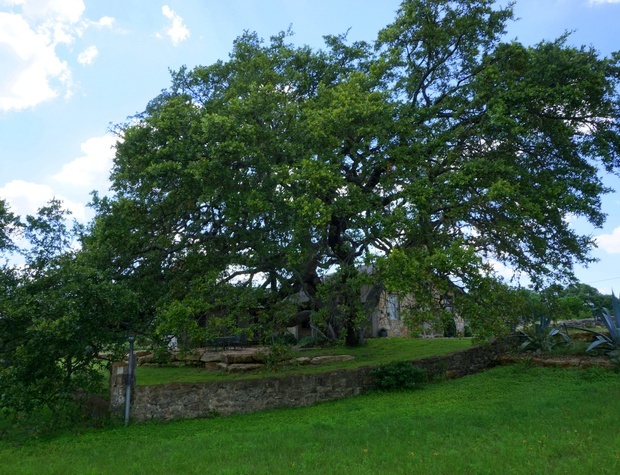 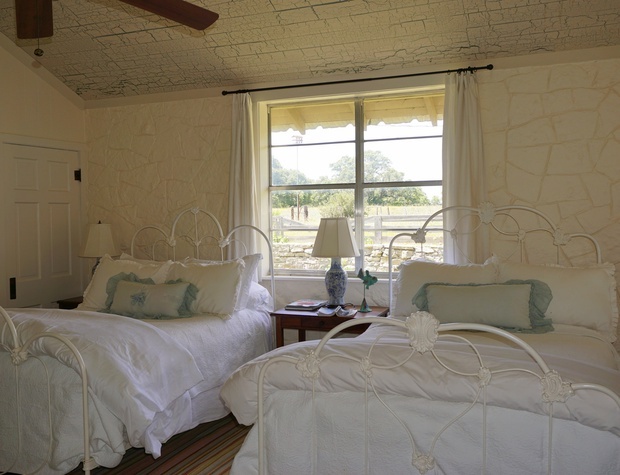 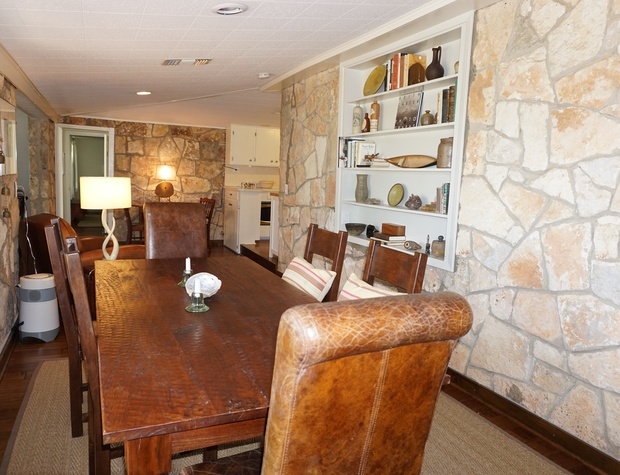 With seclusion and beauty, this property is the perfect for a calming and comfortable vacation in the Hill Country of Texas.